Original Lotus S2 Soft Top Stay Suitable for any S2 with Short Soft Top Please Note: .. Suitable for Lotus 2-11 Lightweight single skin construction approx 2kg Black gel coat fi.. Suitable for all Lotus Exige S2 models Lightweight single skin construction approx 2kg Bl.. Suitable for all Lotus Exige S1 models Lightweight single skin construction approx 2kg Bl.. 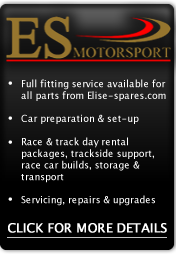 Suitable for all Lotus Exige S2 models will also fit short tail Elise models. Lightweight sin..
*IN PROCESS OF BEING MADE* Suitable for all Lotus Elise S1 models from 1996 to 200.. Suitable for all Lotus Elise models from 2001 on Lightweight single skin construct.. Suitable for all Lotus Elise models from 2003 on Lightweight single skin construct..
Lotus 2-11 Tonneau cover. Remanufactured tonneau cover to suit RHD car. Comes with solid ..